Send your love with three delicate and beautiful long-stemmed roses. 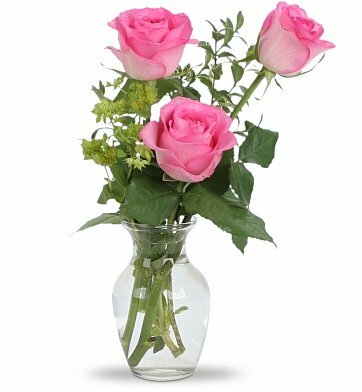 The roses are displayed in a bud vase with touches of baby's breath, caspia, or Monte Cassino for an added romantic touch. Your choice of pink, red, or yellow roses suits the bouquet to the occasion. Three Fresh Roses: Pink, Red or Yellow. During checkout, please be sure to indicate your preferred occasion when you choose a gift card. Exact arrangement and vase may vary depending upon location and availability. Delicate Rose Trio is a hand delivered gift. These gifts are delivered by one of our local design centers located throughout the United States and Canada. Same day delivery is available for most gifts when ordered before the cutoff time. The cutoff time for Delicate Rose Trio is 2 PM in the recipient's time zone. The order arrived on the day I scheduled it for. Didn't see the arrangement, but had no complaints from the gal that got them. The first flower died after 6 days, I would say that is about average. I have no complaints and will use this service again. Granddaughters were coming home from graduation ceremonies in other locations. Sending large bouquets would have been cumbersome, so these flowers were perfect. Happy with GiftTree and would use them again. I contacted Gift Tree to send flowers to Miss Theodora, Monday the 5th. I was informed the flowers had been delivered, but she said she had never seen them. Follow-up by Gift Tree revealed that the florist had a new driver, there were two separate recipients named Theodora (how often does that happen in Palm Desert? ), and so the driver inadvertently gave both sets of flowers to the "other" Theodora. Upon discovering this, Gift Tree had the florist deliver the proper bouquet to Miss Theodora, who was pleased with the gift. Problem resolved with minimal effort by me. All good. Flowers was beautiful and delivered on time. I'll shop again for sure. I ordered these flowers for my granddaughter's birthday. These were the first flowers she had ever received and she was thrilled. My daughter said they were so fresh and looked beautiful in the vase with the greenery. Thank you for helping to make her birthday so special. My dear friend loved the rose trio. Thanks. I sent this to my mother-in-law along with a dozen cookies for Mother's Day. I couldn't believe how she went on and on about the roses and how sweet they were. She kept saying, "it's just right." I have sent her huge lovely bouquets and she always thanks us for them. But this one she raved about! Thanks, you always deliver. I will continue to order from you for my floral/gift needs. The recipient of the flowers raved about how beautiful they were. I sent this (a yellow roses version) to my niece who was recovering from an operation in Michigan, far from me in San Diego. I sent this particular item because I wanted something simple that would cheer her with its bright color but wouldn't overpower or overcrowd her beside table. It arrived promptly and lasted over her hospital stay, opening gorgeously as she recovered. I cannot think of a nicer bouquet to send someone in the hospital. Although the delivery driver had trouble finding the office for delivery during the day, I called customer service in the afternoon and they were able to get the flowers delivered to a residence that night. They were very well liked by the recipient. Thank's for the great service, the care of details, the style, and the beautiful fresh roses you've chosen for my gift!